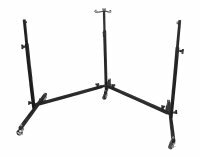 ur Panyard Series Double Stand combines the functionality of our Short Leg stands (item 2016) with the convenience of our Tripod Double Stand (item 2007). The result is a height adjustable stand on wheels which is ideal for Double Pans. The ability to move a set of Seconds as one unit has become a recurring theme in customer responses to this stand. From the instant we finished the prototype version of this stand it became our stand-of-choice for Doubles at Panyard, both around the shop and on gigs. When not in use, this stand will nest with other Double Stands for compact storage. * This stand is also available with a Chrome finish – see item 2031.